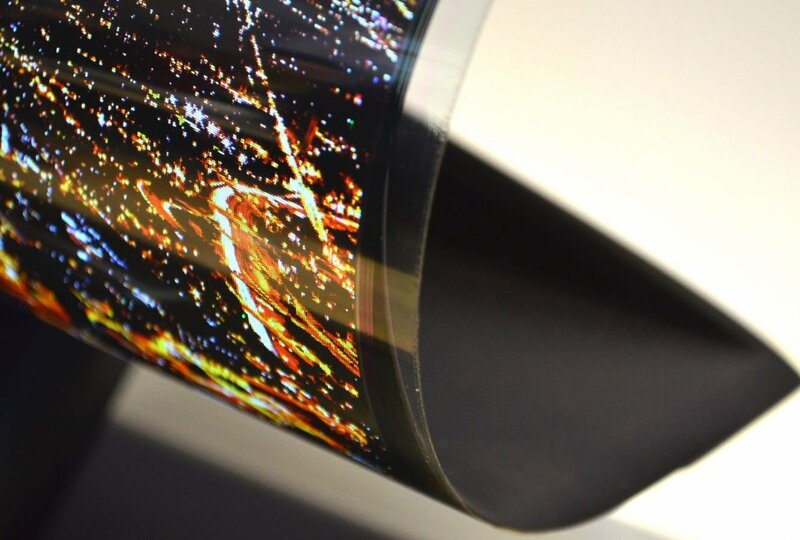 Flexible OLED screens, or FOLED are the future of displays. The technological advances now allow LED, OLED and AMOLED manufacturers to create screens that are bendable and foldable, even when active. A flexible organic light emitting diode is a type of organic light-emitting diode (OLED) incorporating a flexible plastic substrate on which the electroluminescent organic semiconductor is deposited. An OLED emits light due to the electroluminescence of thin films of organic semiconductors approximately 100 nm thick. Regular OLEDs are usually fabricated on a glass substrate, but by replacing glass with a flexible plastic such as polyethylene terephthalate (PET) among others, OLEDs can be made both bendable and lightweight. Engineers now use mostly foldable plastic materials instead of rigid glass. Compared to conventional glass-based displays, plastic AMOLED panels are much thinner and lighter, enabling either slimmer devices or bigger batteries for phone applications, for example. Future flexible displays will also make foldable mobile devices a reality. The two main segments are currently smart phones and wearable devices such as smart watches. However, as the technology matures it will be possible to use those displays in other applications, such as automotive displays. The rise of plastic and flexible displays will be accompanied by a shift from glass substrates to plastic substrates such as polyimide. 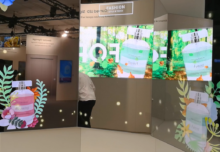 However, glass-based displays will remain an important technology, especially in the TV segment where scale-up and cost reduction are still the main challenges. In contrast, flexible OLED devices can be fabricated by deposition of the organic layer onto the substrate using a method derived from inkjet printing, allowing the inexpensive and roll-to-roll fabrication of printed electronics. 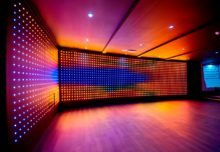 OLED is an emerging display technology that enables beautiful and efficient displays and lighting panels. Thin OLEDs are already being used in many mobile devices and TVs, and the next generation of these panels will be flexible and bendable. Besides the thousands of beautiful design possibilities, a flexible OLED has several advantages especially in mobile devices – the displays are lighter, thinner and more durable compared to glass based displays. OLEDs can also be used to make white lighting panels. OLED is a diffuse area lighting source with unique characteristics. While OLED lighting is still in its infancy, many believe that flexible OLED lighting panels may provide designers with a new lighting source that will create stunning designs. The O stands for organic, and it removes the necessity of a back panel providing light to the screen. Therefore, the display becomes bendable. Developing sufficiently durable and flexible OLEDs will require better materials and further development of manufacturing tools and processes. Flexible plastic substrates need improved barrier layers to protect OLEDs from moisture and oxygen. Thin-film encapsulation also is needed to create thin and flexible metal- and glass-based OLEDs. These advances ultimately may lead to very flexible OLED panels for both display and lighting products, ensuring that any surface area – flat or curved – will be able to host a light source. Substantial development efforts are being invested in this area and, if successful, flexible OLED panels may become commercially available as early as the last half of this decade. Tv suppliers such as LG and Samsung are constantly working on the improvement of this technology and have already presented foldable screens. It is possible to roll it up, but not to fold it flat in two, which operation would damage the display, creating dead pixels. Dead pixels are those that have been damaged; instead of emitting the correct colour, they just appear as a black square. The nowadays technologies allow engineers to create HD flexible OLED screens, but they announce that it will soon become 4K resolution displays ( 4 times HD ). 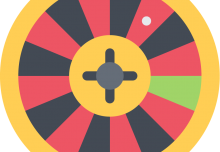 The present resolution is 1200 by 810 pixels. 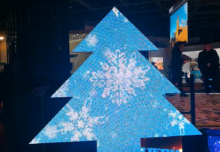 We, at Street Communication, are always updated on the latest LED and OLED technologies to provide the best solution and innovation for any project and are ready to make this huge technological advance into something bigger with larger applications and a perfect final result.